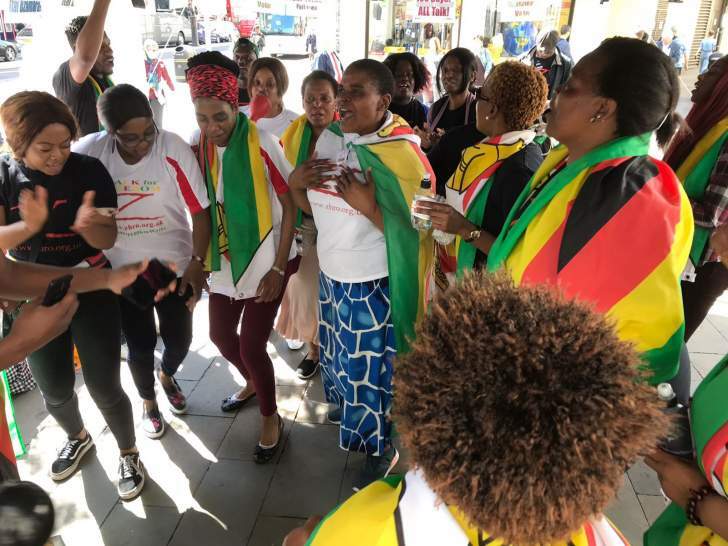 Wednesday - 18 April 2018 - Demonstrators gathered at the Zimbabwe Embassy in London to protest against the celebration of independence. 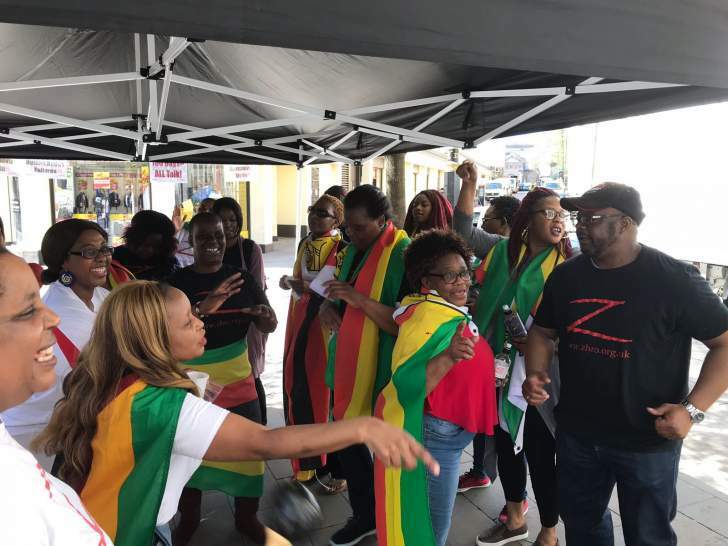 The demonstration organised by Zimbabwe Human Rights Organisation (ZHRO) attracted many Zimbabweans, some from as far as Newcastle and Scotland. Despite the Military government's repeated insistence that -Zimbabwe is open for business - many in the diaspora believe that it has not reformed enough to attract investors. ZHRO views Zimbabwe Independence as a milestone separated by two periods - the first is the independence from colonial rule of oppression and impoverishment and the 2nd independence era of freedom and prosperity - #Take2Zimbabwe. 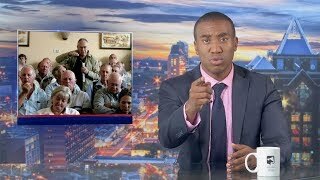 Unlike the citizens of many other democratic countries, Zimbabweans are provided with everyday challenges including poverty, starvation, infectious diseases, and exploitation by the military junta. Zimbabwe independence celebrations highlight the typical hourglass economy of the haves and have nots. Those who have links to the Zanu PF elite are in the upper compartment and bathe in obnoxious ill gotten wealth can celebrate independence. 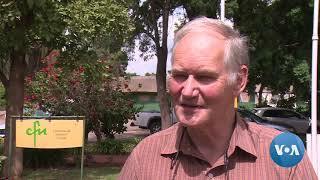 The middle class is almost nonexistent in Zimbabwe. The have nots in the lower compartment of the hourglass were demonstrating outside the Zimbabwe Embassy whilst inside the haves wined and dined with the British government representatives. The British Government officials who attended the celebrations are either complicit or naive as it appears the electoral reforms demanded by all other nations have fallen on deaf ears. Maybe they need to be reminded that the coup brought in a new dictator who is playing a 38 year old game. The motivation behind it being a bald faced capture of our natural resources for the cronies. The benefactors from this most recent newcomer in the musical chairs of African tyrants are the few who have invested heavily in their personal agendas during the 38 years of fake independence. Yet the UK is perpetuating this military regime, fully aware of who and what they are without taking time to ponder the moral or ethical issues. The proceeds from our natural resources are going to continue to be appropriated to the few by the few. Now Zimbabweans can watch the already rich becoming grotesquely enriched until someone younger rises to provide a successful challenge. Many of the demonstrators felt that there was no reason to celebrate when we have had 38 years of dictatorship, corruption, looting, partisanship, insults and deamining slogans, vote rigging and manipulation of election results, poverty, disappearances, and murders. When the country is currently grappling with cash shortages and health crises. Whilst recognising our country's problems, Zimbabweans can be commended for having a spirit of improvisation and adaptation that allows us to cope with our many challenges, all the while, remaining hopeful. Chiwenga has shown that he has no qualifications for the job and no gravitas. His reaction to the Nurses strike is nothing more than that of a head ruffian in a gang of thugs who can never win an election nor can he fare very well before the poor Zimbabweans court of public opinion. One thing is certain, if they do not allow free elections, he will be uprooted by another ruffian. According to Fadzai Mahere, the government cannot fire the nurses before "notifying them of the alleged offence, giving them an opportunity to present their case, giving them the option of legal representation and then adjudicating the issue fairly". A Vice President who dares to cary out appalling barracks action can not do so in an open society. He does not seem to have long term plans therefore he will have power for the time he is able to control the military. Those who came out to demonstrate included: Roseline Mukucha, Sarah Bayisayi, Rashiwe Bayisayi, John Burke, Phillip Nhlanhla, Kingstone Jambawo, Edison Muchirenipi, Mary Muteyerwa, Ebson Chigwedere, Philip Mahlahla, Rosemary Mupunga, Bridget Mupotsa, Isaac Chavasarire, Thandiwe Ncube, Lynette Chivizhe, Stewart Pride Nyandoro, Junior Madzimure, Thenjiwe Ncube, Samantha Mudimu, Sibusisiwe Mapeto, Charity Ndebele, Tryness Ncube, Sibongile Bvungidzire, Molly Ngavaimbe, Sicelo Sibanda, Chegika Lifa Phiri, Hillary J Musarurwa, Mary Ndoro, Sindile Patience Ncube, Namatirai Angela Sithole, Tendayi Chinawara, Nehemia Musonza, Peter Sidindi, Morella Nhau, Martin Chinyanga, and Eletha Mpofu. Thanks to Tryness Ncube for her donation of stationery.